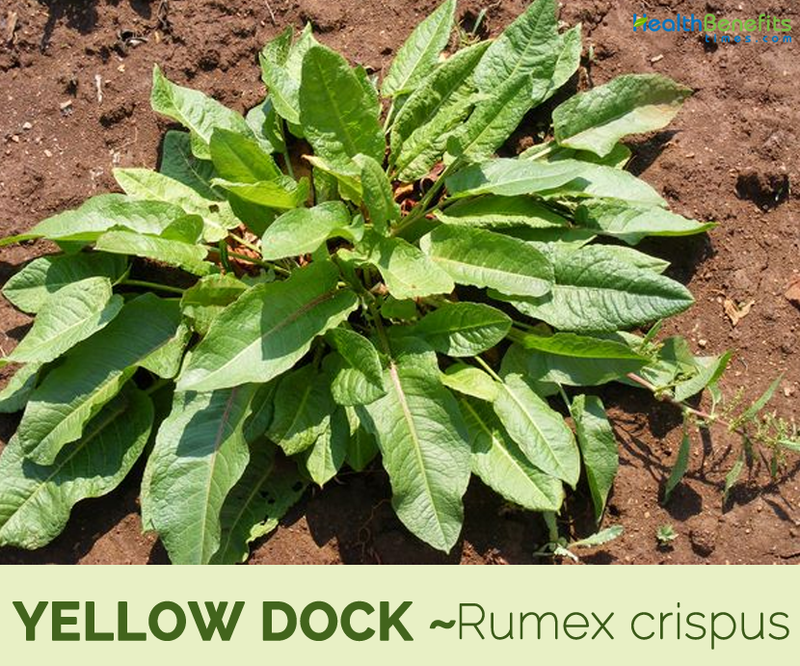 Yellow Dock scientifically known as Rumex crispus is a perennial herb belonging to the Polygonaceae family, commonly referred to as the knotweed family. This family also includes rhubarb, buckwheat, and sorrel. The name was given by Linnaeus and appears to be the only name used in modern literature. 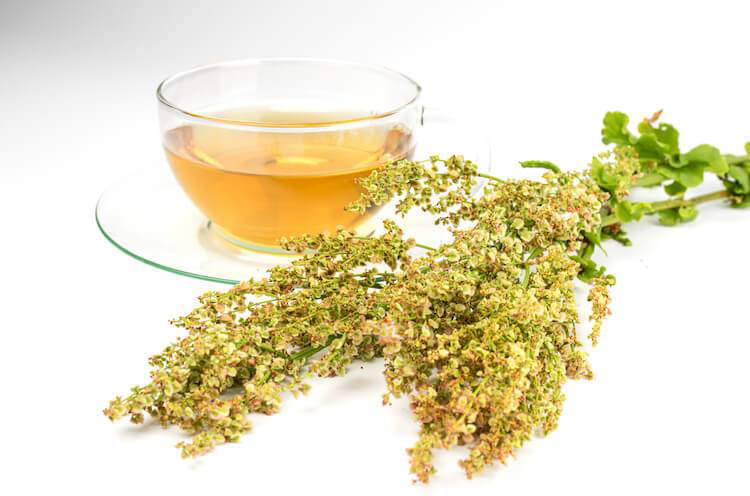 The genus name ‘Rumex’ refers to a noun meaning acid. The attribute ‘crispus’ means curled, which refers to the curly and wavy leaves of this species, as does the common name ‘curled dock’. 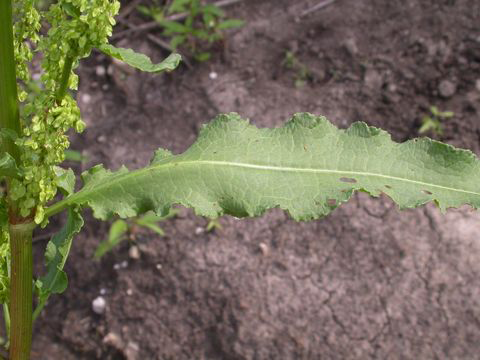 Other common name of the plants are curly dock, curled dock, narrow dock, sour dock, rumex, yellow dock, Chin-ch’iao-mai, garden patience, parell and patience. The yellow roots and rhizomes are used medicinally. Its common name refers to the yellow taproot rather than the flowers or leaves. Yellow Duck is a perennial flowering plant that grows about 40 to 120 cm tall, but plants over 150 cm may be found under favorable growth conditions. It is found growing in seeps, glades, weedy meadows (including areas prone to occasional flooding), pastures and fallow fields, vacant lots, roadside banks and gravelly areas along railroads, edges of yards and gardens, and miscellaneous waste areas. Disturbed areas are preferred. The plant grows on most types of soil. It occurs, however, less often on peat and acid soils and seems to be most competitive on fertile soils. It has large, yellow, forking taproot, up to 8 to 12 inches long, about 1/2 inch thick, fleshy and usually not forked. More or less branched and reaching a depth of 150 cm or more in soils that allow deep root penetration. Externally they are of a rusty brown and internally whitish, with fine, straight, medullary rays and a rather thick bark. Stem has 2-4 cm long, stiff, usually with a smooth, more or less reddish surface. Leaves are bluish green with petioles shorter than the lamina. The upper leaves have no or very short petioles. Lamina is lanceolate, curly and wavy along their margins, 8 to 30 cm long and 2 to 7 cm wide. They have pointed tips and are narrowed at the base. The lamina of the lower leaves has more rounded bases than those of upper leaves on the stem. Inflorescences are racemes, rather dense, mostly between 10 and 50 cm long, representing branches from the axils of upper leaves of the stem and the top shoot. Flowers, in dense clusters, are small with valves (inner sepals, sometimes known as tepals) that are 3-5 mm long and wide on pedicels which are 5-10 mm in length, green in the beginning and brown at maturity. Both bisexual and female flowers occur on the same plant. Fruit is achenes that are triangular in cross section, 2-3 mm long, 1.2-1.7 mm wide, with a shortly pointed base and a somewhat more long-pointed apex. The achenes, which have a shining reddish brown surface, are enclosed within three inner sepals (valves), which are heart-shaped with entire margins, first green, and brown at maturity. 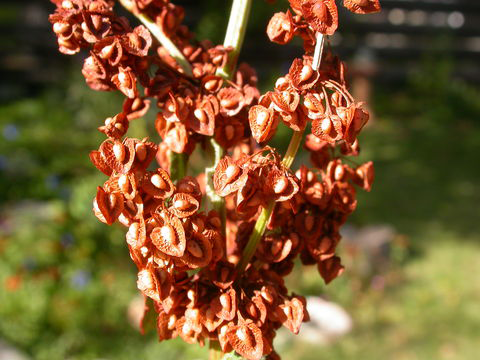 The seeds are more or less polymorphic, mainly differing in size. Yellow Dock herb was particularly appreciated for just about all conditions and diseases affecting the skin including acne, psoriasis, leprosy, ringworm, herpes, eczema and dermatitis. Curly dock is a native of Europe, but today it occurs worldwide: above the Arctic Circle and on all continents. It is considered a weed in about 40 countries, making it one of the world’s most successful non-cultivated colonizing plants. 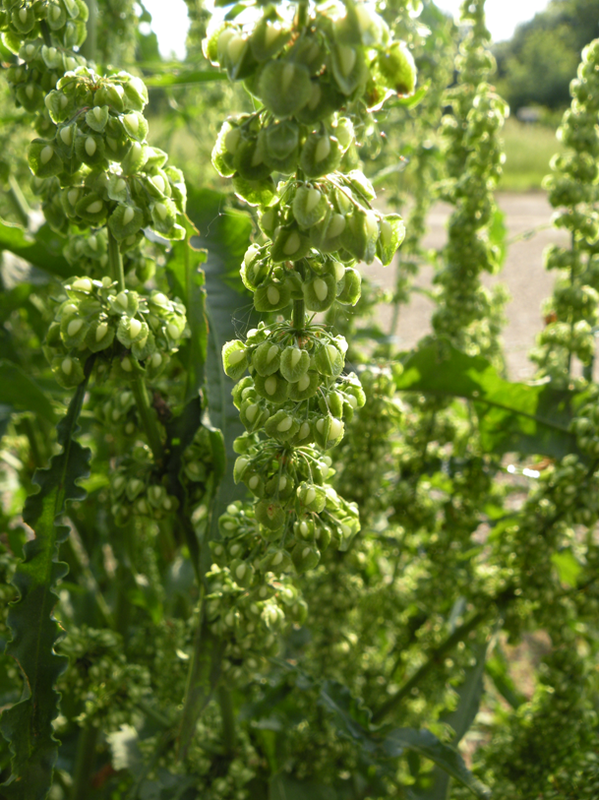 Curly dock is a common but not necessarily serious weed in 16 crops including pastures, hay crops, small grains, orchards, lawns, and home gardens. 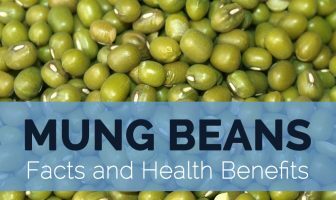 It occurs throughout Ohio and surrounding states, and is commonly found along roadsides and waste areas where it tolerates poor drainage but favors nutrient rich soils. Diarrhea is one of the symptoms of Malaria. Diarrhea can be reduced by drinking the yellow dock tea. Yellow dock is effective to heal the diarrhea since it has been known as the traditional remedy for malaria. Other symptoms of malaria are fever and hot-dry skin can be prevented by drinking yellow dock tea. Thus, yellow dock can be anti-malaria medicine for those who have the malaria symptom. While treating the diseases yellow dock is also used as the blood cleansing or detoxification. The yellow dock help in detoxification process with many functions. It is effectively known as the blood cleanser and lymph cleanser. Root of yellow dock is able to remove the lingerie waste on intestinal tract and also stimulate the frequency or urination in which it can help the elimination of toxin. Anemia is the condition in which the blood causes tiredness and also weakness in extreme level. Research has proved that yellow dock root can heal the anemia and it is known as the herb which can cleanse the blood and also strengthening the body. For those who want to try to heal anemia can take root of yellow dock and simmer it for making a tea. Yellow dock has been known to heal diseases including arthritis and rheumatism. Yellow dock as tea can reduce the pain related to arthritis and rheumatism since it contains anti-inflammatory properties. For those who suffer from those illnesses can take yellow dock leaves or root as the herbal tea to reduce the pain of arthritis and rheumatism. Yellow dock has been known for its rich source of vitamin A, manganese and also phosphorus which known as the effective medicine to treat fever and also suppressed the appetite. Yellow dock can be used as the daily drink in order to prevent fever. Yellow dock consists of the methanol extracts which is useful for DNA and other protections inside body. It is also helpful to prevent free radical scavenging and also preventing enzymes of production in glucose. It shows that yellow dock root can be the anti-diabetics. Moreover research suggested yellow dock as the anticancer since it can protect the DNA and protein. Anthraquinones contained in yellow dock helps to stimulate peristalsis of the intestines, which increases bowel transit time. Generally, people tend to use harsh, addictive laxatives to address constipation. Even naturally-occurring strong herbal laxatives can result in dependency and damage to the mucosal lining of the intestines. Because yellow dock has a smaller percentage of peristalsis stimulating ingredients, it can be used for a longer period of time with more gentle, yet still effective, benefits to digestive transit time. It is good news for people who is suffering from liver disease that Yellow dock can handle this problem. Yellow dock root and leaves can be the alternative medicine for liver disease as tea. Several researches have revealed that yellow dock can help the patients of liver disorder. Even it will not cure totally but it can be the alternative to help and treat liver well. 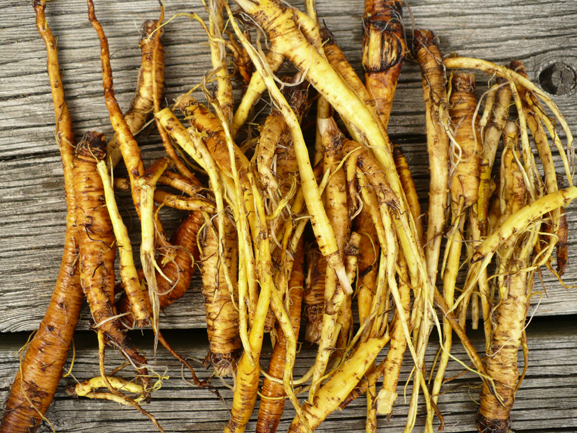 Skin problems such as acne, psoriasis, age spots, rashes, eczema can be healed by yellow docks’ root. The process of treating acne is by soaking the cotton balls in it and applied in face or wherever the acne rises. Besides, yellow dock treatment can make a good smell while it is applied on face. It is also used as a daily cleaner for face. Yellow dock’s leaves and root can be used as tea to prevent and treat digestive problem while it is also able to reduce the alleviate stomach acid and heart-burn. It works properly by increasing the digestive enzymes and also stomach acids. Additionally the root and leaves of yellow dock can reduce the liver problems as mentioned above. Research has demonstrated that yellow dock has a function to process out the excess hormones. It has been found as the effective way to reduce PMS and menopausal formulas. Yellow dock leaves and root can be made as tea or herbal drink to heal the PMS pain. For those women who suffering from PMS or other menstrual pain disorders, yellow dock tea can be the effective way to be consumed as daily herbal drink in order to heal the pain of menstruation. Yellow dock is known as the metal element remedy which can reduce the throat sore and also guts. It is widely known as the effective herbal medicine for sore in throat and also coughs bronchitis and even laryngitis. In Western herbalism, the root is often used for treating anemia, due to its high level of iron. It can be powdered and given in capsules, often in combination with stinging nettle – Urtica dioica. Plant will help with skin conditions if taken internally or applied externally to things like itching, scrofula, and sores. It is used mainly for respiratory conditions, specifically those with a tickling cough that is worse when exposed to cold air. Zuni people apply a poultice of the powdered root to sores, rashes and skin infections, and use infusion of the root for athlete’s foot. It is a gentle and safe laxative, less powerful than rhubarb, so it is particularly useful in the treatment of mild constipation. Plant has valuable cleansing properties and is useful for treating a wide range of skin problems. Root is alterative, antiscorbutic, astringent, cholagogue, depurative, laxative and mildly tonic. It is used internally in the treatment of constipation, diarrhea, piles, bleeding of the lungs, various blood complaints and also chronic skin diseases. Externally, the root can be mashed and used as a poultice and salve, or dried and used as a dusting powder, on sores, ulcers, wounds and various other skin problems. Root has been used with positive effect to restrain the inroads made by cancer, being used as an alternative and tonic. Seed is used in the treatment of diarrhea. Homeopathic remedy is made from the fresh root, harvested in the autumn before frost has touched the plant. It is only used in the treatment of a specific type of cough. It is largely recommended for diseases of the blood, from a spring eruption, to scurvy, scrofula and chronic skin diseases. It is also useful in jaundice and as a tonic to the stomach and the system generally. Seeds have been given with advantage in dysentery, for their astringent action. It encourages peristalsis and increases the mucous production in the body. It is a natural remedy for water retention, inflammation of the bladder and urinary stones. It slows down the oxidative damage and prevents free radical damaging. It alleviates stomach acid, heartburn and indigestion. It increases the frequency of urination and removes the toxins from the body. It cures pain and inflammation of Nasal passages and respiratory tract. It treats bacterial infections and sexually transmitted diseases. It is used to treat anemia, diarrhea. It can also help to cure skin diseases. Skin Diseases: Take the fresh roots of yellow dock. Coarsely grind the roots. Squeeze the roots to extract juice. Apply fresh juice over the affected area. Leave it for 2 to 3 hours and wash with normal water. Anemia: Add one tbsp of coarsely grind roots in a cup of water. Boil for 10 minutes. Have a cup of decoction once in a day. OR Purchase capsules from the market. Have one capsule every day. Alternative: It has an affinity for the gastrointestinal tract. Constipation: Take fresh or dried leaves of Yellow dock. Boil 2 to 3 leaves in a cup of water. Have it 3 to 4 times a day. You may add honey to taste. Indigestion: Take chopped roots of yellow dock in a cup. Pour over some boiling water. Cover it and let steep for half an hour. Filter and reheat. Drink according to your need. Detoxidant: Boil few roots of yellow dock in 100 ml of hot boiling water. Boil it for 10 minutes. Strain it off. Drink this decoction daily to remove bad toxins and bacteria from the body. Heavy Menstrual Bleeding: Take 10 drops of Mother tincture 2 times in a day. 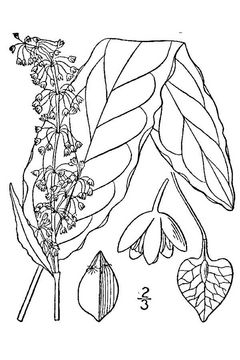 Elephantiasis: Make a concoction of cleavers leaves, yellow dock root, pokeweed root, Echinacea root, blue flag root and marigold flower. Take twice a day. Skin Diseases: Make a fine paste of cleavers, yellow dock and burdock. Apply topically. Heavy Metal Poisoning: Take a handful of garlic, ginger, coriander and yellow dock. Coarsely grind them. Mix in 2 bottles of Apple cider vinegar. Keep for one month. Strain and drink 30 ml every day. Drink for 15 days every 6 months. Chicken Pox: Prepare a decoction by taking equal quality of the roots of burdock, goldenseal, yellow dock, Sponge the whole body with this water. Small Pox: Take burdock root, yellow dock root and goldenseal in equal quality. Prepare a tea. Have bath with this tea. 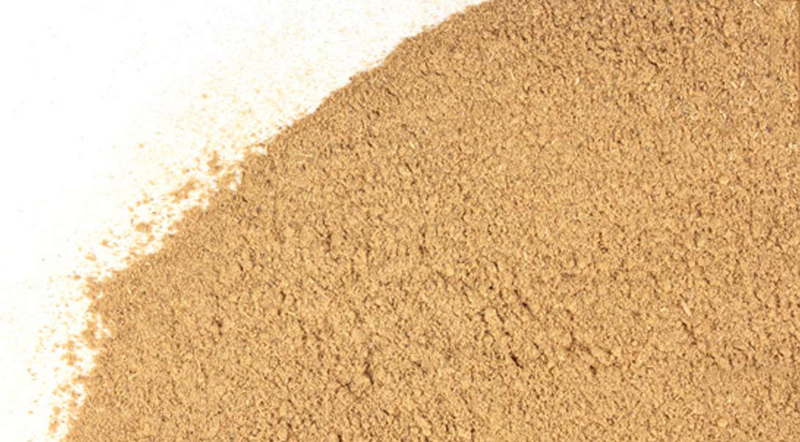 Liver diseases: Take 1 to 2 g powder of yellow dock root, red sage, Sarsaparilla and Pau de Arco. Mix each herb into a wide mouth jar. Shake it up and your perfect formula for liver detoxification is ready. Prepare the tea and add 2 to 3 full drops of the milk thistle seed extract to the tea. Let it cool and drink. Take this tea twice a day. Nickel Allergy: Prepare a concoction made of yellow dock root, burdock root , goldenseal root. Wash the affected area with it. Young leaves can be added directly to salads in moderate amounts. 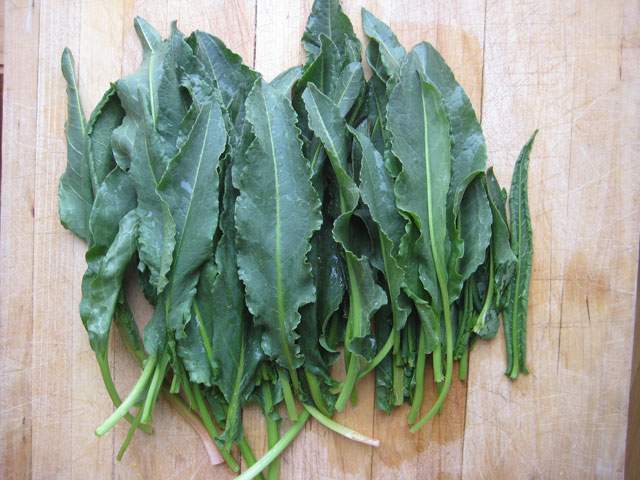 Leaves can be added to salads, cooked as a potherb or added to soups. Stems are consumed raw or cooked. Stems are best peeled and the inner portion eaten. Seeds can be used as a piñole or can be ground into a powder and used as a flour for making pancakes etc. 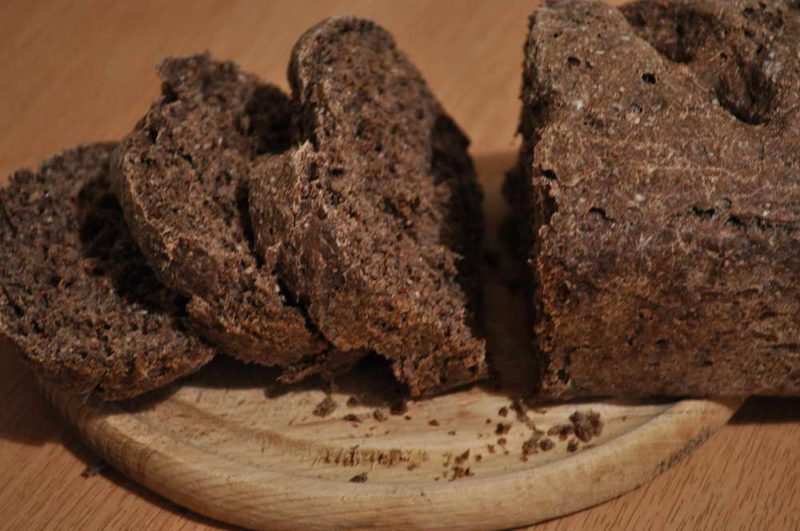 Roasted seed has been used as a coffee substitute. Boil water along with yellow dock as well as vanilla for about 15 minutes. Turn off heat, stir in burdock and cover. Let the brew to steep for around 30-60 minutes. Again Add 2 cups of water and rewarm to serve. Pour through a strainer. Sweeten to taste with honey or stevia. Yellow dock helps to treat the minor constipation, chronic skin problems and anemia. It also helps to detoxify the liver. 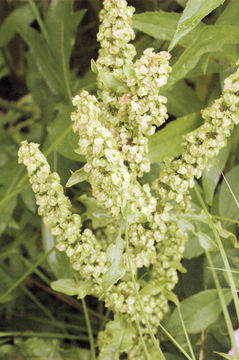 It is also recognized as Rumex crispus or even curly dock. 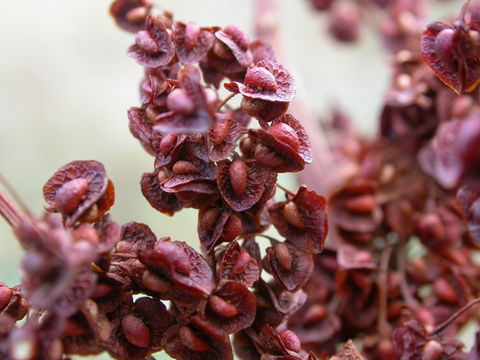 The plant has curly leaves which are long and upright stalks which are covered with reddish seed heads in the fall. According to naturopathic doctor Sharol Tilgner, the yellow dock root tea is mainly used for non-spasmodic constipation. The small amounts of anthraquinone glycosides are mildly laxative which helps to increase the tone of the intestinal walls. The yellow dock tea helps to clear skin eruptions and assists the liver function. It is also known as blood purifier. In 2001, the study which is published in “Journal of Agricultural and Food Chemistry” states that the tea of yellow dock leaves and seeds possess the antioxidant properties which helps to reduce the perioxide formation by 96 percent in the experimental model which helps to indicate the free-radical scavenging in the body in high potential. According to Tilgner, “Yellow dock tea helps to treat the anemia which is caused due to the iron deficiency and helps to absorb the iron.” When it is combined with the burdock root or horsetail along with blackstrap molasses then it helps to maintain the healthy iron level in the body. According to the University of Maryland Medical Center, yellow dock root can bring back the hemoglobin to the normal level if taken alone or with other herbs such as dandelion and alfalfa. According to UMMC, the dosage of yellow dock tea is 1 teaspoon of dried root should be simmered for 20 minutes in 1 cup of water. Yellow, dark green to brown and dark grey dyes can be obtained from the roots. A curly dock plant produces around 40,000 seeds per year. They can lay dormant for up to 50 years. Besides being beneficial, the overuse or prolonged use of yellow dock root may also cause certain side effects. The usage of yellow dock root for the long time may lead to stomach cramps, diarrhea and intestinal obstructions. The laxative effect may be harmful to the pregnant or nursing mother. So it is not recommended for the young children and pregnant or nursing woman. The continuous usage of yellow dock root causes the failure of kidney. The oxalic acid could bind the calcium in the body which leads to the kidney stone formation. The one who already suffer or is suffering from kidney stones should take it under the guidance of physician. 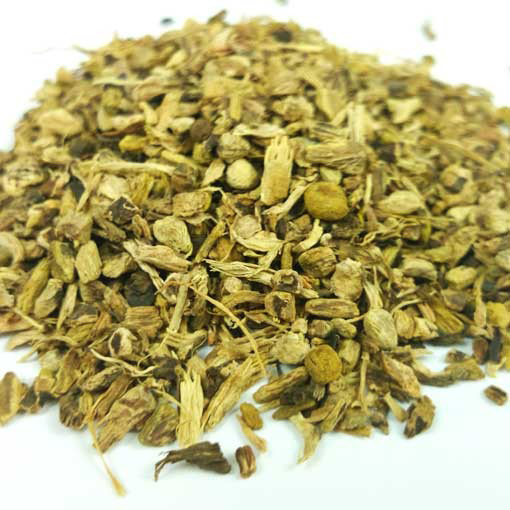 The usage of yellow dock root can result in the enormous loss of potassium levels in the form of excessive urination or loose bowels due to its laxative nature. It leads to the muscle weakness, irregular heart beat and low blood pressure. The continuous or excessive usage of yellow dock root may result in skin allergies, blood clotting and poisoning. It can worsen the condition of stomach ulcers. So the people suffering from the stomach ulcer should avoid the consumption of yellow dock root. Due to the laxative property in Yellow Dock root, it can interact with the drugs such as Warfarin, Water Pills and Digoxin. It may result in side effects so the one should avoid the yellow dock root while taking these drugs. Leaf Bluish green with petioles shorter than the lamina. The upper leaves have no or very short petioles. Seed Shiny, brown and encased in the calyx of the flower. They are more or less polymorphic, mainly differing in size. This plant should only be consumed in moderation as it can irritate the urinary tract and increase the risk of developing kidney stones. It should be used with care during lactation, as it may cause a laxative effect in the infant. The plant may also cause intestinal discomfort to some people. Avoid during pregnancy & breast feeding. Excess doses can cause gastric disturbance, nausea and dermatitis, skin problems, cramping and diarrhea. Leaves should not be used for preparing soups and salads, it might be toxic. 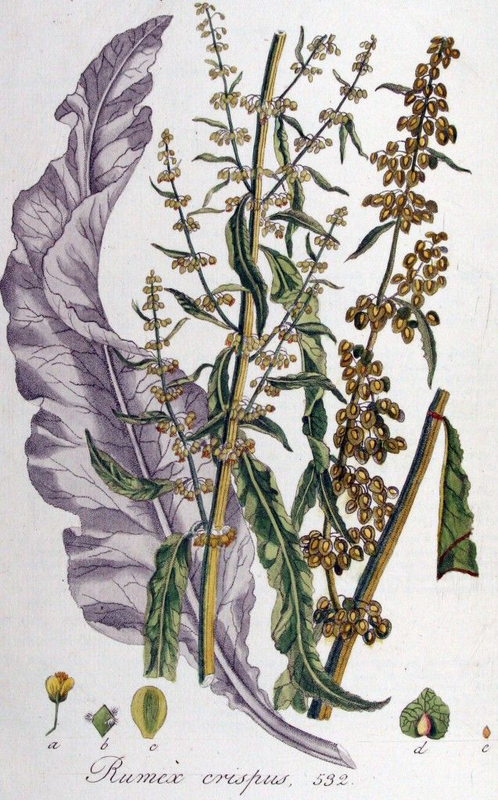 Rumex crispus ssp. 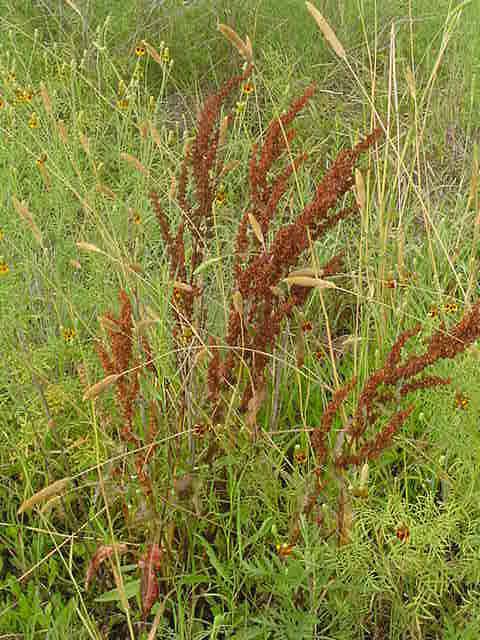 crispus L.
Rumex crispus subsp. 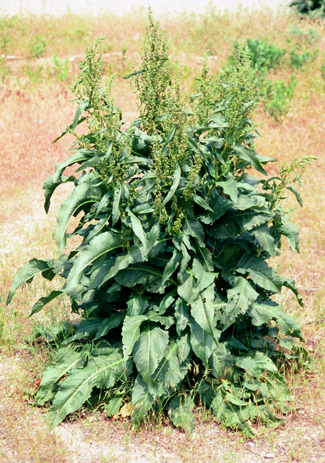 crispus L.
Rumex latifolius Roem. & Schult.